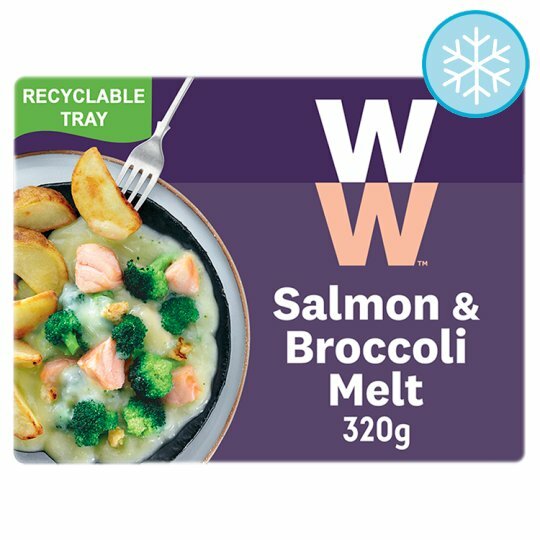 Salmon and broccoli in a savoury sauce, covered with a crumb and mozzarella cheese topping served with crunchy potato wedges. Keep Frozen., Store in freezer at -18°C or colder. Do not refreeze once thawed. Cooking Instructions (General): COOKING INSTRUCTIONS* - COOK FROM FROZEN. *These are for guidance only. All appliances vary. Although extra care has been taken to remove bones, small bones may remain. Do not defrost before cooking. TAKE CARE: PRODUCT WILL BE HOT. Do not re-heat once cooled. Contains raw fish. Microwave (From Frozen): Microwave: Remove film lid before cooking. Stir product halfway through cooking. Microwave: 750W - Cat D; Full Power: 10 minutes; Stand: 1 minute. Microwave: 850W - Cat E; Full Power: 9 minutes; Stand: 1 minute. Oven cook (From Frozen): FOR BEST RESULTS. 1. Preheat the oven to 200°C (400°F), Fan 180°C or gas mark 6. 2. Remove film lid and place on a baking tray.